Bay to Breakers With No Drunk Tank? Organizers decide on a sobering tents instead. Bay to Breakers 12K is one of the world's largest and oldest footraces, featuring world-class athletes in addition to costumed runners. A new development at this year's Zazzle Bay to Breakers, instead of sending drunk runners to jail, they'll be pulled off the route and taken to sobering tents. A spokesman for the event says the race simply puts too much stress on city jails and hospitals. There were 26 ambulance trips to the hospital, 30 tons of trash and hundreds of reports of public urination and defecation during last year's race according to the San Francisco Examiner. To avoid that trouble this year, race organizers plan to enforce a zero tolerance policy for alcohol and kegs. Anyone breaking the rules will be pulled off the course and placed in a sobering tent. "Come in costume, come naked, just don't come drunk," race spokesman Sam Singer told the Examiner. The sobering tents are expected to offer juice and water to sober people up. There's even talk of a designated driver service. The Citizens for the Preservation of Bay to Breakers says the plan goes against the culture of San Francisco and the Bay to Breakers. 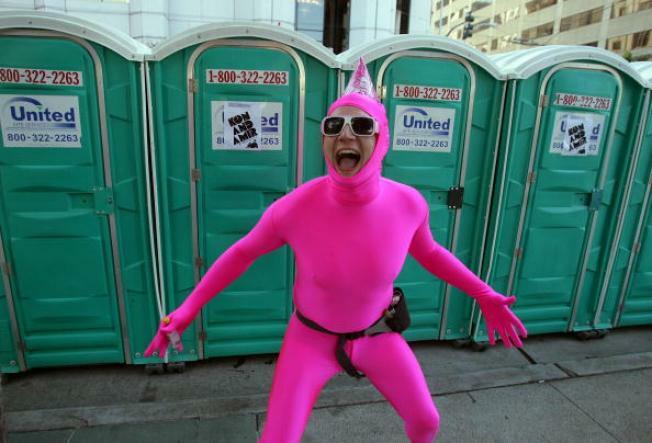 The 100th annual Zazzle Bay to Breakers race will take place on May 15. All 55,000 race spots are already filled.